Is eating store-bought ice cream bringing you down? Well, let Cool Cones turn that around! First, you need hands to be able to deal, hold, and play the cards. Hands that you could simply use to PLAY THE GAME. Second, you — wait, forget a second point. I think the first point about HANDS says it all. The Eye-Fi memory card has been out for less than a year and noticeable improvements have been made in that time. 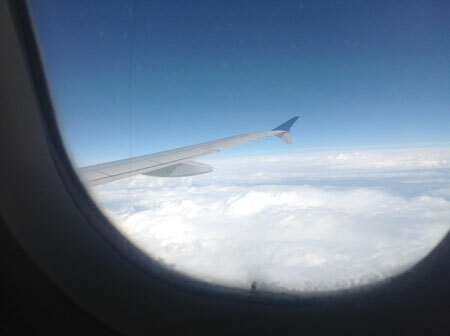 As I type this, I’m roughly 35 thousand feet in the air. I didn’t intend to be on a flight this this weekend, but my plans changed at the last minute. I checked my schedule and rearranged a few things, and here I am getting face time with some clouds. Jetting off across country may sound exciting and fun. And, it is. But, for people like me who love to plan ahead, last minute trips usually are a source of stress. There’s an odd combination of excitement mixed with the feeling you get when you go through the triple loop of a rollercoaster. There’s something about an unplanned trip that can make your stomach do a few summersaults. Fortunately, there are some things you can do in preparation of your next spontaneous adventure. Here’s what I did over the last two days to add this quick trip to my schedule without too many hassles. Most of us have people in our lives who can help us out in a pinch. Be sure to have those friends/family members on stand by and speed dial in situations such as this. They may be able to jump on the computer for you as you pack and help find a way to the airport/train station/bus terminal/car rental shop, research what kind of weather to expect at your destination, and help you find a way to get to/from the airport/train station/bus terminal at your destination. Really good friends and family members might also agree to watch your pets or house sit for you or make sure that your plants get a little sunshine and water while you’re away. Check in or get your tickets in advance online, if possible. It will save you few minutes and help things go much more smoothly on travel day. Luckily for me, I checked in for my flight a day in advance and pre-arranged to automatically check-in for my return flight on Sunday. The airline I flew then sent my electronic boarding passes to my email address. Advance check in and electronic boarding passes also mean quicker boarding times and no paper clutter when I get home. Of course, it does help if your smart phone (or tablet) is charged. I lucked out there, too. My plane has power outlets so I can charge up and have enough battery power to make calls once I land. It also helps that I have a few tools that I normally use to get stuff done. Today’s post comes courtesy of my iPad, Bluetooth keyboard, and Evernote account. Both devices fit easily in my Butler bag and are lighter and easier to carry around than my laptop. The nice thing about spontaneous trips is they are spontaneous. 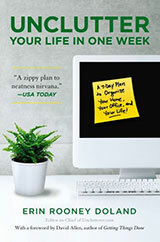 But, that doesn’t mean you can’t do a little advanced planning for when those moments arise. I know someone who always keeps a packed bag in the trunk of his car. His go-to items include a sweater and some T-shirts so that he’s ready no matter the weather. If a full bag isn’t your style, you can keep a packed toiletry bag in your luggage with a travel toothbrush, small tube of toothpaste, comb, 3 oz. shampoo bottle, and other supplies. You might even like to make packing lists for different types of trips — weekend at the beach, weekend in the mountains, trip to see mom, four-day conference — ahead of time and save these checklists in Evernote so you won’t forget anything the next time you travel. Staying current with your laundry also helps to make sure you always have clean clothes when you need them. You won’t miss out on a trip because you have to do a load of wash. Owning an overnight, duffle, or weekend bag will also come in handy, and you can save time at the airport by having your name/address tag already filled out and attached to the bag. If you travel often, you may also benefit from an extra phone charger, so you don’t have to go searching for one before you leave. Chances are, by rearranging your usual plans to make room for the unexpected trip, you might be reducing how productive you would normally be. If that’s the case, use some down time, like when you’re on the plane or waiting for your connecting flight to get some work done. That might mean writing out your grocery or to-do list for when you return, reading that book you’ve been meaning to crack open (that book for me is The $100 Startup), or drafting a report. Sure, get stuff done (if you have time) so you don’t have an overflowing plate when you get back. But, don’t get so focused on working that you lose sight of having a bit of fun. Take advantage of the new opporutunity you have, whether that’s meeting new people or having new experiences. Your mind and body will feel less sressed and you’ll come back ready with lots of memories and stories to share. For the past couple months, the advertisements that appear in the far right column of my Facebook page have been full of unitaskers. I’m not sure what it is about my profile that has changed that now suggests I want to buy unitaskers, but I have clearly become the target market for vast quantities of trinkets and doodads. Now, if I were a professional baker who made dozens of 10″ or 11″ round layered cakes a day, I can see how something like this might be useful. Since I’m not a professional baker, though, it falls into the category of Misdirected Marketing. First off, how many 10″ or 11″ round cakes might the average non-professional baker make in a year? And, what if I want to make a 9″ round layered cake or a 12″ round layered cake or — and now I’m getting crazy — a rectangle layered cake? 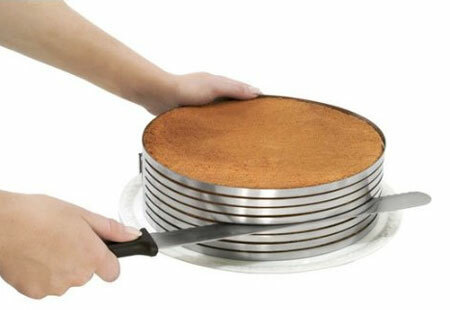 Would I have to buy separate Piece of Cake Layer Slicing Kits at $60 a pop for those, too? How else could I possibly cut those cakes? Well, I know the answer: I would put the cake on a lazy susan, use a serrated knife, hold the knife relatively still at the preferred height, and move the cake in a circle and across the knife. (Just like this woman does in this YouTube video.) This method has worked great for me ever since I learned to bake and decorate cakes. Also, even if the layer is a little crooked, it doesn’t matter — because it’s cake! Cake is gladly devoured by friends and family irrespective of how perfectly cut the layers are! I know this is true because during a power outage this year, I decorated my son’s birthday cake in the dark, and the layers were uneven and the whole cake was a little lumpy, and everyone at the party still gobbled down the cake. No one refused to eat the cake because it wasn’t perfect. Why? Because crooked cake tastes just as good as perfectly level cake. Reader Jenny is worried her clutter and lack of house-keeping skills are damaging her marriage. Is paper causing you stress? Are you noticing piles at every turn? Paper clutter can be a thorn in your side, but there are things you can do straight away — yes, right now — to banish the paper monster (or at least put it in its proper place). Along with previous tips we’ve shared, here are six more things you can do immediately to keep paper clutter to a minimum. Greeting cards (and other types of stationery) are a great way to keep in touch with the people we care about and to celebrate special moments with them. But, what happens when you buy a card for someone and then can’t find it? Oftentimes, these cards co-mingle with documents in paper piles, making them difficult to find. Instead, store blank cards separately from your other paperwork in a specific spot, folder, or something like a card organizer. Use a greeting card organizer to categorize/store blank (not sent) cards. Only keep cards you’ve received that have high sentimental value in an archival box or card book. If the cards aren’t particularly special, snap a picture and recycle them. Unwanted credit card offers can fill your mailbox and increase your mail processing time. If you receive a large number offers, this can be very frustrating. Unless you plan to apply for the credit card, remove the offers from among the mail you need to read/act on and shred them immediately (or put them in your shred bin to destroy later). Be sure keep them out of your recycling bin to reduce your risk of identity theft. Sign up for OptOutPrescreen to stop receiving preapproved credit card offers in the mail. Children’s artwork can be difficult to trash or recycle. The artwork provides wonderful memories and, if your child is particularly creative, you may have a large collection of their work. When that volume outgrows your display areas (like the front of your fridge), you could find them scattered about your home. Consider creating a display wall or mount two or three frames that will hold the most prized pieces (and rotate in newer work). You can also turn the artwork into interesting things like placemats, postage stamps (Zazzle.com or PictureItPostage.com), photo books, or a stuffed toy. Not sure which ones to keep/display? Choose the artwork that is most meaningful to you, or if your child is old enough, allow him to pick the ones he loves. Select a display area for your child’s masterpieces. Keep all artwork that you still need to decide on in one location. Take pictures of the artwork you like but don’t want to keep/display and give the originals to a grandparent or friend. Couponing is very popular these days and can be very helpful when used for items that you use frequently. Like other paper that you get on a regular basis, they can get out of hand and get lost in the paper mess. Cull your coupon collection by removing those that have expired and keep only the ones for products/services you use often. Keep coupons in a coupon holder, plastic envelope, or binder. Sign up for digital coupons that can be scanned from your smart phone (or that are attached to your store loyalty card). Why are magazines so difficult to purge? Perhaps it’s because their covers promise fascinating stories and lifehacks that can streamline the busiest of households? It’s no wonder they end up in almost every room in your home, infiltrate your bags, make their way to your car, and even find a long-term spot in your office. Somehow, they seem to compel us to keep them well beyond their usefulness. Do your best to get rid of them before the new one arrives in 30 days. Instead, use the table of contents or the cover stories to decide which pages you’ll keep and scan for future use. And, remember that you’re likely to find the same content online as many publishers create e-versions of their articles. Donate magazines to doctor’s offices, senior or community centers, art teachers, or your local library if the magazine is extremely popular or very rare/expensive. Cancel your subscriptions and only purchase the issues you need or save the online version. Create specific (paper or electronic) folders for each page you keep (“patio project,” “decorating ideas,” “healthy eating,” etc.). Do you like jotting down notes or your to do’s on slips of paper? Writing task lists can help you organize, prioritize, and focus on your to-do items. They can also get mixed in with other types of papers and disappear rather quickly. This means you’ll probably spend too much time looking for that phone number you wrote down, the paper with the things you needed to pick up at the grocery store, or the sticky note with the name of that app you wanted to download. Keep your notes and lists in a spot where you’ll remember where you put them and can easily access them, and, once you’re finished with them, recycle or shred them if they contain sensitive information. Write task and grocery lists in a notebook instead of on scraps of paper. Take a picture of your note or list and upload it to Evernote. If your notebook is not accessible, use your smart phone to record a voice memo instead. If you attend conferences, you will invariably get reading materials from the conference organizers, from the sessions you attend, and from the vendors you meet. And, if you’re like many people, though you may be interested in reviewing everything once you get home, you probably forget about it. To avoid conference paper pile ups, schedule an hour on your daily calendar the day you return home or the next day to go through all your conference materials. Bookmark the sites of vendors you’re interested in researching further. Recycle flyers and other unwanted conference brochures. Scan pages you want to keep from the program book or session notes (or simply keep the CD, if one is offered). Are pine cones some special class of yard debris that require VIP treatment? Are they too good to be touched by a rake? My boyfriend and I live in a small-ish condo in Toronto. I’m working very hard on decluttering our home, but one thing I have no idea what to do with is his hockey equipment. Half of our spare room is full of hockey gear, and I’m not sure where to put it. We have no available closet or storage space. Have you seen any creative ideas on how to store hockey gear in small apartments? Every once in a while, a question comes into my inbox that stumps me completely. I know nothing about hockey or what equipment it requires beyond a stick and a puck and skates. My initial thoughts are that going vertical, and using wall space would be very helpful … but I’m only guessing. This is one of those times I want to let the readers with experience give advice for how to store hockey gear in an organized fashion. Please, fill the comments with your helpful insights. I’m extremely interested in reading your advice, too. Thank you, Jen, for submitting your question for our Ask Unclutterer column. I’m hopeful our readers will be able to help. First, a quick look at the applications. In this case, I’ll create a notebook called “Instagram Backups.” It will hold all of my photos for me. Evernote is available across nearly every platform, including Apple, Windows, iPhone/iPad and Android. I wouldn’t want to work without it. The social photo-sharing app is owned by Facebook and on smartphones everywhere (it’s available for the iPhone and Android). It lets you take photos, apply a variety of artistic filters and share easily with family and friends. You can even note where you took a given photo. It’s useful and easy to use. IFTTT (If This Then That) is the scripting tool I’ve mentioned previously. You can create helpful, automatic little “workflows” without having to know any code or specialized computer programming. It’s my favorite thing to come out of the Internet in a long time. The idea here is that IFTTT will notice when you snap a photo with Instagram and place a copy in Evernote for you. This creates a backup and makes that photo available to you across every device that’s running Evernote for you. To get it working, follow these steps. Log into IFTTT and enable the Instagram and Evernote channels. Click “Create a Recipe.” The “If this then that” prompt appears. Click “This” to choose the “trigger.” Navigate to Instagram and click it. Select “Create image note from URL.” This will create a new note in Evernote with your photo attached. That’s it! Now, every time you shoot a photo with Instagram, a copy will be sent to Evernote automatically. Nice! I mentioned that Dropbox was optional. (Dropbox is an online back up service for your computer. There are numerous online back up services available, this is just an example.) If you want to use it as your backup repository instead of Evernote, follow the steps above swapping Evernote for Dropbox (or whatever service you use). Or, make a second recipe with Dropbox to create two backup copies simultaneously. Have fun! At $160, this Elegant Baby Cup signals to all the other babies that your baby knows how to live it up and fine dine with the mucky muck. Even though your baby can’t hold up its head or find its mouth with regular consistency, pay no mind. Forget bottles or breastfeeding, only chic and impractical food delivery systems for all the babies in your house. Also, your son or daughter’s tiny fingers are perfect for getting silver polish up under that handle to get rid of tarnish. Bonus! Besides, your baby had nothing else going on except for just laying there, being a baby. 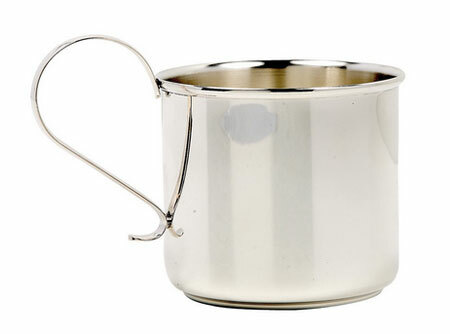 Polishing silver is such a great task for infants as it gives them something to do. Teaches them responsibility and what-not. Congratulations, owners of the Elegant Baby Cup, you’ll probably win parent of the year for all of your awesomness! On September 10, The Economist published the article “Great digital expectations” discussing the consumer shift from print to digital books. This is a first: Today’s unitasker is so outrageously mind-boggling I don’t even know what it does. If you have school-age children, you’re well aware that some mornings can be difficult. Even highly organized children have a few mornings each month where there is a melt down and things fall apart. Here are a few tips to help get your children (and you) out the door on time. How can you use a freezer to help with meal planning? One strategy for buying in bulk and using your freezer to help ease the tensions around meal preparation time. Uncluttering can lighten your load and put cash in your pockets if you choose to sell items you no longer want. You also can save money by repairing broken items instead of replacing them with new purchases. But, one of the downsides of selling (and other money saving ideas) is sometimes you can end up with more clutter than when you started. It works out this way because you likely add new items before the old items leave your home. And, if you don’t get them out quickly, they can linger and commandeer much needed space. It can be tempting to stock up on coupons and sale flyers, particularly when you know you can save quite a bit when you go shopping. Couponing, like any other project, needs to be a regular part of your routine. If you don’t have a specific space to keep the coupons (along with the large quantities of things you get), they can start to fill every available room in your home, leaving you with less living space. Try this instead: Share the couponing experience with a friend (or two) so you won’t have to store every sale or grocery store flyer. You’ll also save some time when you meet up with your couponing partners to process your coupons (be sure to add these meetings to your calendar). Bulk purchases can offer big savings and a high volume of products that can last for quite a while. But, therein lies the issue. Because you have such large quantities of items, you will need to consume perishables (meat, poultry, dairy) and other items before they expire. These items can languish in your pantry or fridge and end up not saving you money in the long run. And, unless you have ample space to store everything, your purchases may begin to clutter other areas of your home. Try this instead: If you find that you don’t use everything you buy before it expires, consider splitting the cost and sharing your haul with a neighbor or friend. This will give you a chance to use everything you buy and still reap the cost savings. Also, designate specific areas of your home for storing bulk items and do not go beyond those limits, irrespective of how good of a deal something is. 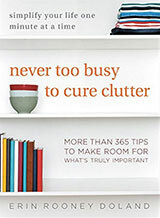 I recently read a New York Times article that described the author’s love of coffee and the clutter that came from it. She saved Starbucks coffee bags to take to her local store because she’d get a free 12-ounce cup of coffee (a savings of $2). I’m sure coffee lovers everywhere were rejoicing at the opportunity to get free java. As it turned out, she didn’t make it to the Starbucks closest to her home very often and her collection of coffee bags became a source of clutter that she ultimately trashed. I feel her pain. A few years ago, I amassed a collection of bath poufs (mesh sponges) I purchased from a local store that encouraged patrons to bring back old ones (that were fraying and no longer wanted) to get new ones free of cost (the store recycled them). I also didn’t make it to that store often and decided to pitch my collection. At the time, it seemed like a painful decision. Afterall, I was missing out on something free. While you might not keep a stash of bath accessories or coffee bags, you could be more inclined to stock up on plastic bottles and soda cans. Keeping these two items out of landfills is a good goal to have and you can get some money for them. When you return plastic bottles and aluminum cans, you can collect $.05 for each one (depending on where you live). If you tend to save up recyclable containers so you can return them for cash, they can quickly outgrow your space and infiltrate several areas of your home. Try this instead: Pick a spot to store the recyclables as well as container that fits that space. When the container is full, stop collecting and schedule a time to return them. If your container is overflowing and you haven’t had time to take them in to the recycling center, consider putting them out on the curb with your other recyclables. Do you save scraps of wrapping paper not big enough to wrap a gift with the intention of making something crafty with them? How about lonely socks (single socks with no mate) that you plan to include in a project you saw someone post about on Pinterest? Are you really going to create a window valance out of those hankerchiefs you never use? While you may be saving money by using what you already have to make something new, unless you actually upcycle them, they will begin to clutter your space and leave less room for more valuable things. Try this instead: Be very selective about the scrap materials (and volume) that you keep and store them in one location. And, think about other ways to use those useless things yourself (wear unmatched socks at home, use scraps of paper as padding for things you’re shipping), or donate them to a school or daycare center in your neighborhood that wants them. Depending on the item, you can save money by doing your own repairs (like hemming your pants or replacing buttons). If you pick a day every week (or month) that you’ll fix a handful of things, you can continually reduce the volume of your fixer-uppers. But, if this is not something you enjoy doing (or know how to do), you could find yourself overwhelmed with lots of things that need mending or fixing. Before you attempt a repair on your own, find out if the manufacturer offers that service for free. Some places, like Coach, will fix wallets (and other items they sell) without charging you or give you a new one (same value as your original purchase) if they can’t repair it. Another option would be to keep the things that are easy for you to do and trade the things you don’t want to do yourself with another person. This could mean that you’ll take on a task they don’t like doing, so you’ll both get your jobs done without having to do the task you wouldn’t otherwise complete. Or, you can barter an item (they fix your thing and you give them a thing that functions well but you don’t want anymore). You can also let go of those items altogether by using Freecyle. It’s not unusual for someone to accept an item that needs a little repair work. Clothing is often a popular consignment item. It can be hard to let go of some pieces, especially if the purchase price was pretty high. Consigning is a great idea if you have the time to take items to the consignment shop and your items are exactly what the consignment store wants (they can be very picky). But, you’ll lose out on the money you could be getting if you have bags and bags of things you intended to sell that are simply sitting around and cluttering up your home. Keep a basket in your closet or laundry area for things you want to consign. Once full, put them in your car immediately so they don’t linger in your home. If, after a reasonable amount of time (you’ll hate seeing them in your car) they haven’t made it to the consignment, drop them off at donation organization (or arrange to have them picked up) to get the tax write-off. Have a clothing swap party and trade the items you no long want (or that don’t fit anymore) with friends and/or family. Go ahead and try your hand at turning your clutter into cash. Just be sure the things you need to do are reasonable for your lifestyle and not too demanding on your time and won’t clutter your space.